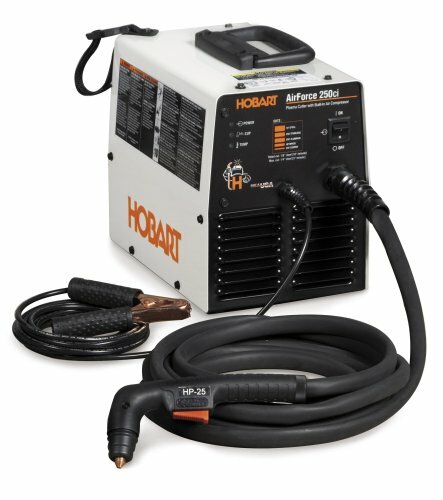 Hobart Airforce 250ci Plasma Cutter Review! Want a heavy-duty but light-weight plasma cutter with a built-in air compressor? You don’t have to buy a separate one with the Hobart Airforce 250ci. You will be ready to cut steel precisely and faster than oxy-fuel torch welding. Unlike traditional torch welding, plasma cutting offers less room for warping because it brings fewer heat-affected zones on your work. You don’t have to worry about pressurized gas cylinders or refills – save more money and effort in the long run. Adjusting the gas pressure settings and amperage also doesn’t matter anymore – all you get is precise and cleaner cutting. With this light weight plasma cutter, you will be able to cut through 1/8 and 1/4 inch mild steel, so you will find it very convenient if you mostly work on sheet metal and plumbing – or just about any DIY work or project in your home or workplace. Save time and effort by making clean, precise and faster cutting with a plasma cutter like this. Some people might complain that the plasma cutter could run slower than most cutting tools, whether for 1/8 inch or 1/4 inch steel. But the catch is it still cuts precisely so if you’re not in a hurry or if you’re a hobbyist then this should be a fairly good tool to invest your money on. The Hobart Airforce is built to be lightweight at only 27 pounds. It comes with a cable management strap to keep your gear organized when you are moving from place to place. It also has a “fan-on-demand” to clean up dust and debris that are getting inside the unit – no more internal cleaning needed! The torch is also ergonomic – designed to keep you comfortable at all times and still work for what you paid for and meet or even exceed your expectations. It also saves the torch tip for further use because it easily and automatically cools down using a post-flow air cooling system after you have finished cutting with it. A bunch of LED lights also give you information on temperature, power, and when the torch is ready to go. 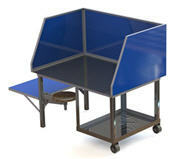 It also has a themed overload protection when it reaches 104 degrees F (35% duty cycle). Did I mention that this machine has a very long hose that allows you to reach many places in one go? It is very helpful in case you are working on a field or house with limited wall sockets or power sources. A user’s manual is available when you buy / order the plasma cutter. The whole setup package comes with the HP-25 torch, the air compressor (piston-driven), a standoff guide, a power cord, a work clamp and some consumables for your weld work. A little info: plasma cutters also have a good resale value. 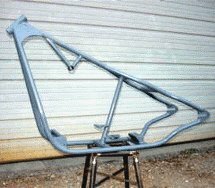 Plasma cutters are different from oxy-fuel torches, so if you are new to them, it might take some getting used to. For instance, the grip should not be too stiff but a bit relaxed when you handle this so that you’ll be able to achieve your desired results and cut precisely. Choose your extension cord carefully, as it might go off when you use a low-quality one. If you don’t have to use an extension, a direct plug is the best solution, because it already has quite a long hose for you to reach further places. Whether you use it for pluming, DIY projects, or even in car and automobile restoration, the Hobart Airforce Plasma Cutter with Air an Compressor is quite a handy tool that will save you time and deliver perfectionist results.